There are a few “gurus” out there promoting a rearward barrel acceleration, which I agree with. However, in teaching young hitters the concept over the past few years, with no disregard for pitch depth, some of my most clean hitters – mechanically – were having challenges getting to the inside pitch. Rearward barrel acceleration is good, but MUST not be a blanket teach for all pitch depths. The best hitters, like Mike Trout, alter the timing of the barrel’s release off the back shoulder. Enter the content of this video. Same pitcher would help control timing variable. 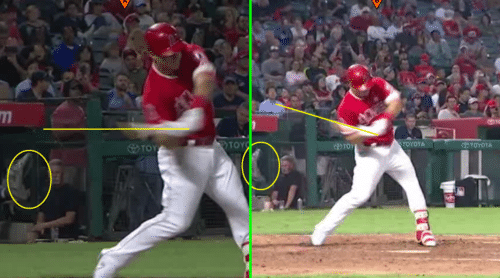 CLICK HERE for a recent post on how to fix alligator arms, and how to practice what Mike Trout is doing with hitting the different “catcher’s gloves”. Good stuff as always. I can’t argue with Mike Trout’s success. I can’t find fault with your conclusions about bat path either. However, I have a problem with his head position. Though he doesn’t quite violate Kelly Starrett’s “one-joint rule,” he almost does. He looks restricted, especially on the inside pitch. If hitting is a guess, as suggested by Perry Husband or hitting is a prediction as concluded by A. Terry Bahill and T. LaRitz in the Carnegie-Mellon study over 30 years ago, why does Trout put his head on his rear shoulder like that if he can’t see the ball hit the bat? Ted Williams said that he couldn’t see the ball hit the bat, how can Trout? He can’t. So, why the head movement? Joe, love your comments. However, I’m not sure I agree that Mike Trout is in a bad “one-joint rule” position. He seems to keep similar distance between both ears and their respective shoulders at and post impact. To be honest, I don’t like the framing or the terminology of the so called “rearward movement”…. By the way, we are talking about barrel moving rearward….that just happens!!!! Djura, the reality in teaching this is there are numerous young hitters casting the barrel too early…almost like an away approach. The problem is they do this on ALL pitch depths. Hence, the need to drill this. I don’t like the term. Some kids will think they just have to drop their barrel. It happens naturally if the sequence is set in motion properly. Front side shoulder, elbow, and hand must do their job, the rear shoulder, elbow, and hand must do theirs. Joey, look at this article…. it’s interesting… however I read some really interesting articles… if you want me to ever forward articles I find interesting I can… I would have at least two more that I think are really interesting…. This article I thought was interesting especially the last few lines and this visual thing…. One connection I made was when your presetting, it seems like your resisting and as thus you know where the movements are and it’s already an imprint in your mind…. Djura, great article. What I’d love is if you find a great article, please post and share a quick summary of what you got out of it. I’m reading and working on so many things right now, I don’t have as much time for other things. Thank you my friend, that would be a HUGE help. I do think that the early barrel movements and directions are good indicators that separate hitters …along with ball exit velocity…. To make it even more confusing, ill tape other parts too… Once they notice the moving parts it’s like magic…. Joey any thoughts…. Have you ever taped parts? Do you think it’s a good teaching method? Djura, if the teaching method works, it’s effective. But may not work for all, but if you can find something that works for most, then you have a winner. I more than realize that it would be considered heresy to criticize Mike Trout nowadays since he is considered to be the best player in the game. However, his head movement looks awkward. His swing on that inside pitch looks forced. I don’t think that head movement is efficient. But, as you have said many times a hitter can be effective without being efficient. Does a great athlete like Trout succeed despite inefficient head movement as do J. D. Martinez, Kris Bryant, and Andrew McCuthcheon? I think that Trout-like head movement is a product of the “Batting Tee Generation,” who were taught to put their head down and to the side in an attempt to see the ball hit the bat, which we both know is neurologically impossible. And Trout is attempting to see and hit 100+ fastballs yet. I find it interesting that you don’t see such Trout-like head movement with hitters from the past – Ruth, Williams, DiMaggio, Mantle, Maris, Mays, Aaron, Clemente, Bonds, Griffey Jr., just to name a few. Wonder why. Could it be that a lot of them (maybe with the exception of Bonds and Griffey Jr.) weren’t brought up hitting off tees? Joe, maybe my standard is pretty low with one-joint rule…compare Bryce Harper to Trout…he makes Trout look like Mays!!! I don’t like what Arenado does either. I think that to use that cue wouldn’t be effective. If the sequence I described isn’t in place to cause the bat barrel to go rearward, a hitter would find it hard to do so, and likely just drop their barrel. – Inside: First barrel move is more toward the catcher even as far as the outside right shoulder of the catcher for a righty hitter. – Middle: First barrel move right in the middle of those two locations. Obviously these aren’t conscious moves in a live swing, but when I slow it down this is what I feel. I think the way the swing starts is how the plane is set and determines your ability to square it up. The danger I see in working with younger players especially is that only that “middle” swing pattern gets worked on and grooved. And that plane doesn’t work with all pitch locations. What’s your thoughts on this? I bring it up because I think it’s pretty closely related to what you’re explaining here. Matt, right on! That’s another way of explaining it. I agree, I feel like most hitters are either taught to “swing down” (inside pitch approach), or deep barrel acceleration (outside pitch approach), but not taught the middle. That’s one thing I forgot to include in this post…when I throw LIVE or soft toss my hitters, then they default to middle approach and adjust from there. This is of course, they’ve done enough swings to feel each imaginary catcher’s glove. Making the conscious, unconscious. Don’t know how Bryce Harper does it. Nolan Arenado is almost as bad. Trout doesn’t go to that extreme. Kris Bryant (Got a kick out of his father saying that they patterned his swing after Ted Williams. Nowhere near Williams’ swing.) and J. D. Martinez almost do, though. I think Trout just looks a little forced. Seems he’s restricting himself. He got exposed up and in during the ALDS a few years back. I think he corrected it to an extent, likely lays off that pitch. Don’t get to see him enough since he’s on the West Coast. Like you have said many times – great athletes being effective without necessarily being efficient. Yeah Joe I agree. However, even though some of these guys may have one chink in their armor, that’s about it. They made it to this level for a reason. The more chinks in the armor, the less likely they move up the ladder. Said another way… it doesn’t matter where the the ball is because your palmer flexing to the right of the ball…. THE BARREL JUST KNOWS WHERE TO BE… perhaps after a little practice…. Your welcome!!!! And please cite your sources… like … some old stickball guy who grow up in Queens…. That will do….? Only if I was a mind reader…. but once you do this… it must be it!!!!! !And I just told you!!!!! Hopefully we are starting from a protracted and depressed shoulder and…. with our pelvis tucked in with a short foot…. So yes your complicating it when looking at the barrel…. just feel the handle go to the right and through the ball back to the inside… where the handle goes the barrel follows… at the end of our load the lead forarm starts it…than and only than we should feel the bat in our forearms and the snap in our wrist and fingers…. From the elbows down should be built in with a purpose…. I don’t disagree with you. It’s all a question of finding the right words to describe what is happening in the swing. Btw, what what is palmer flexion? with a “palm up/palm down” approach, his front elbow positioning affecting barrel path. The barrel path for different locations is similar to the action of a flipper on a pinball machine. Would I be correct using that analogy? I have a player who brings his hands diagonally down across the front of his rear shoulder. You’re not advocating that, are you? I have been trying to correct that. Joe, the pinball analogy is a darn good one! It’s all based on swing intention. Whatever the hitter has to do to knock off the catcher’s glove in the proper pitch depth position. Not an original but I like that analogy. Here we go discussing semantics again. Not sure I like the term, “swing intention” because, in my mind, it connotes a conscious effort. A hitter doesn’t consciously “intend” to swing a particular way, though he winds up doing so. It’s an unconscious reaction, the product of thousands and thousands of reps. Thanks for your response. Good stuff as always. Joe, maybe I wasn’t clear in explaining swing intention…”intention” is the same as if I had an axe in my hand and went to chop down the tree. In that sense, I don’t care how mechanically I do it, I’m just going to chop down the tree…that’s intention. Hitters would use the same thing…I’m going to “compress the baseball”, “hit the ball as far as I can over there”, “knock the 2nd baseman’s hat off”…that’s what I mean with swing intention. Also known as external cueing.